Allergies : Fish vs. Shellfish Allergy: How Do They Differ? Fish and shellfish may both fall into the seafood category, but they are biologically different, and this distinction is particularly important to someone with a food allergy. An allergy to fish is not the same as an allergy to shellfish. There are two kinds of shellfish: crustacean (such as shrimp, crab, and lobster) and mollusks (such as clams, mussels, oysters, and scallops). According to Food Allergy Research & Education, reactions to crustacean shellfish tend to be particularly severe. Individuals who are allergic to one group of shellfish can sometimes eat varieties from the other group. However, since most people who are allergic to one type of shellfish are allergic to other types, allergists usually recommend avoiding all varieties. To avoid a reaction, it's crucial to avoid shellfish and all shellfish products. Touching shellfish can cause an allergic reaction, and being in an area where shellfish is cooking may trigger a reaction as well from the protein in the steam. Shellfish may not cause a reaction in someone who has an allergy to fish, such as tuna, salmon, halibut, or cod. People with a fish allergy may be allergic to some types of fish but not others. 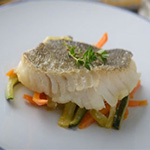 Most allergic reactions occur when someone eats fish, but allergic individuals can sometimes react to touching fish or breathing in vapors from cooking fish. There are an estimated 20,000 species of fish and dozens of varieties of shellfish. For a list of the most common fish and shellfish that are reported to cause allergic reactions, visit Food Allergy Resource & Education. You'll also find a list of unexpected sources of fish and shellfish, such as sauces, salad dressings, nutritional supplements, and more.